Several books have been written on Euler’s famous identity relating trigonometry and complex numbers, books that one might classify into a niche genre of what could be called biographies of equations. To this genre Robin Wilson brings a new addition. 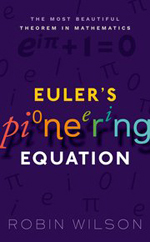 Wilson focuses on Euler’s equation, the almost mystic entity that reads connecting arguably the five most fundamental constants of mathematics via two of its most fundamental operational symbols. To start off, Wilson relates how this equation has been voted the most beautiful mathematical theorem on different occasions, both by groups of physicists and mathematicians. While the book doesn't endeavour to ask the question of what makes the equation beautiful or elegant, it promises to show readers what might make this so marvellous a result that Richard Feynman should have opined "it is a result that everyone should know". Wilson chooses to devote a chapter each to the ingredients before putting them together into Euler's equation in the last chapter. He paints from the perspective that by bringing our attention to each of the symbols in the equation in turn, we may get a fresh appreciation and understanding of Euler's equation. We start with chapters on zero and one. Perhaps predictably, these focus on the history of these numbers, starting in Mesopotamia, India, and China. The ancient historical accounts are by no means extensive, but contain many intriguing tidbits of information. The oft-talked about Mesopotamian base-60 system for instance is lucidly explained, with examples and simple translations into modern language. One can't help but notice the author's peculiar fascination for little geo-political trinkets — mathematicians from Britain and nearby areas are geographically located almost right down to their village. There are curious little descriptors such as "John Napier, Eighth laird of Merchiston", but a steady loss of detail when it comes to historical facts drawn from other parts of the world. It could be considered a missed opportunity that although historical facts introduce mathematicians, who sometimes make multiple appearances across the book, not much is offered in terms of character portraits or anecdotes that might give the readers a glimpse of the personalities behind the maths. Historical aspects discussed in different chapters are often only nebulously connected, so that it feels a bit like reading separate entries in an encyclopaedia. Most sections make for a breezy read, and could serve as good motivations for some maths, for example the discussion on the "near misses" of Bernoulli and Roger Cotes, who were investigating the area of ellipsoids, in discovering what we know today as Euler’s theorem. Once in a while, though, we find digressions that obscure the flow; for example, introducing quarternions and octonions in the chapter on adds little to the theme of the book. To someone familiar with maths at the typical undergraduate level, the book is quite unsatisfying. It rushes through many ideas, and even though a chapter each is spent on the constants , , , , and , they end up being a collection of facts, rather than a coherent (mathematical) story. The chapter on , for instance, suffers particularly from this issue, and seems like a messy toolbox of series approximating , and mnemonics for remembering digits of . Students of mathematics would still find this book interesting, however, for the many facts and bits of history that one normally does not encounter in university. In being a small encyclopaedia of sorts, the book can certainly hold its own in the public outreach department. In all, Robin Wilson offers a book that promises to whet the mathematical appetites of middle and high school students, and one that makes for a good recommendation for a weekend read, or a pleasant present for the coffee table. Sathyawageeswar Subramanian is a PhD student in Quantum Computing at the Department of Applied Mathematics and Theoretical Physics at the University of Cambridge. Euler’s equation, the ‘most beautiful equation in mathematics’, links the five most important constants in the subject: 1, 0, π, e and i. Central to both mathematics and physics, it has also featured in a criminal court case, on a postage stamp, and appeared twice in The Simpsons. So what is this equation – and why is it pioneering? Robin Wilson’s main areas of interest are the History of Mathematics (British history from 1600, especially the period 1840-1940) and the history of graph theory and combinatorics.